A few thousand miles in a couple of hours—it’s an itinerary impossible to keep using any other mode of transportation. Business aviation connects the world in a way that’s unthinkable if attempted commercially. And within the business aviation community, customers and corporations have a variety of needs. Some fly weekly with large groups of passengers. Others fly daily with one or two individuals. Regardless, this tool increases productivity and allows businesses that wouldn’t otherwise have a global presence access to that ability. Even in a continually connected world with Skype and cell phones, that face-to-face meeting and tangible handshake cannot be replicated. That’s why one customer came to Duncan Aviation’s Battle Creek, Michigan, location with his Bombardier Global Express and requested we convert it into his own flying hotel room and office. “Our customer essentially lives on his aircraft. He is constantly flying from one meeting to another, so he needs a place to work, rest and reboot,” explains Designer Lori Browning. Interior reconfigurations and design updates allow for some of the most creative modifications in an aircraft. Add Duncan Aviation’s in-house engineering team to the mix, along with the company’s Organization Designation Authorization, and we can make pretty much anything a reality. 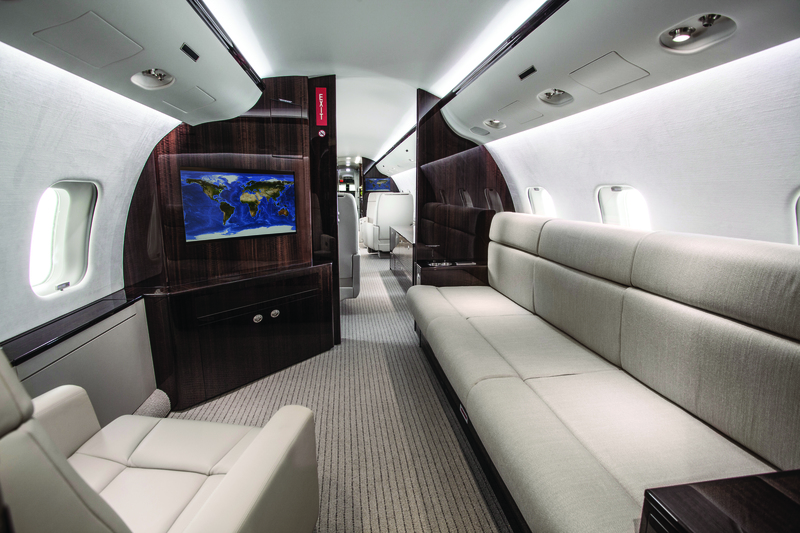 As one of the most frequently flown Global Express aircraft in the world, this exceptionally mobile jet needed to be highly personalized for the individuals who spend countless hours on board. “We completed many reconfigurations in the cabin to give our customer the storage space he needed for a wardrobe and everything else one needs when they travel constantly for business, while still retaining enough seating for other passengers,” says Lori. After completing the aircraft’s required 2A and 1C inspections, Lori and a team of engineers worked to remove two club seats toward the rear of the aircraft and added an entertainment cabinet with a counter and drink ledge. In the mid-cabin area, they swapped out a single seat and work station for a credenza to increase storage space. Along with all of these changes, the look and feel of the cabin’s interior was updated. The aircraft started with a very warm color scheme—creams and red wood—and the final scheme used high-contrasting dark wood and taupe. With this color swap, the owner decided to add new seats, new veneer, install electric windows with a single-control panel and reconfigure the PSUs, as well as the switches. “It was essentially a brand new aircraft by the time we were done, and there’s nothing out there quite like it,” says Lori. The customer also chose a Rockwell Collins Venue Audio/HD Video Entertainment and Cabin Management System, an HD-capable, touchscreen-controlled system. While adding this upgrade, the customer also decided on EMTEQ Quasar II cabin upwash and downwash lighting. It was the first time these two options had been combined, so Duncan Aviation worked with Rockwell Collins and EMTEQ to ensure the two systems operated seamlessly. The installation also included an Alto Technologies Audio System, which was the icing on the cake. 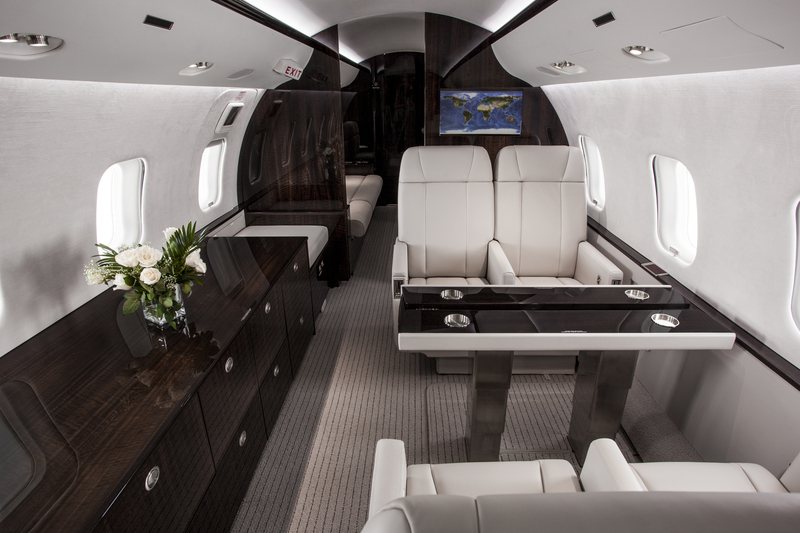 While the CMS works well for entertainment purposes during downtime, for a business aviation traveler, the data network, wireless and wired options make the cabin an airborne office.